Home » » Chinatown, The Two Jakes "Special Collector’s Editions" coming in November. Chinatown, The Two Jakes "Special Collector’s Editions" coming in November. Paramount Home Entertainment has announced “Special Collector’s Editions” of Chinatown and , it’s sequel, The Two Jakes will be released on November 6th. 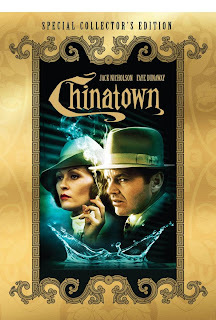 Landmark movie in the film noir tradition, Roman Polanski’s Chinatown stands as a true screen classic. Jack Nicholson is private eye Jake Gittes, living off the murky moral climate of sunbaked, pre-war Southern California. Hired by a beautiful socialite (Faye Dunaway) to investigate her husband’s extra-marital affair, Gittes is swept into a maelstrom of double dealings and deadly deceits, uncovering a web of personal and political scandals that come crashing together for one, unforgettable night in…Chinatown. Chinatown picked up an Oscar for best Original Screenplay as well as getting nominations in ten other catagories. It also won an Edgar and Golden Globe for Best Picture. Chinatown: The Beginning and The End! 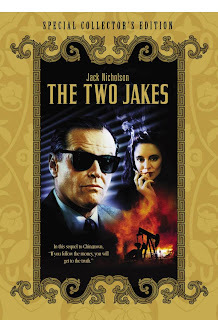 Jack Nicholson returns as private eye Jake Gittes in this atmospheric Chinatown follow-up that’s hit upon “the elusive sequel formula for somehow enhancing a great original” (Mike Clark, USA Today).Much has changed since we last saw Jake. The war has come and gone; 1948 Los Angeles teems with optimism and fast bucks. But there’s one thing Jake knows hasn’t changed: “Nine times out of ten, if you follow the money you will get to the truth.” And that’s the trail he follows when a routine case of marital hanky panky explodes into a murder that’s tied to a grab for oil–and to Jake’s own past. For more info on forthcoming DVD releases, check out The Crimespree Cinema DVD Calendar. I have been feeling the same way about Grosse Point Blank. Gimmie a decent edition of it! Cusack and Pivens doing commentary. I was hoping they would do this soon. Can't wait for this release!! !